The School of Economics’ seminar series hosts well-known speakers from around the country. Friday, May 10, 2 p.m.
Dr. Yang’s research includes corporate finance, microeconomictheory, and applied theory. Friday, May 24, 2 p.m.
Dr. Chodorow-Reich research focuses on macroeconomics, finance, and labor markets. Dr. Lubik’s research interests include monetary policy, indeterminacy, search and matching in labor markets, open economy macroeconomics, and Bayesian estimation. 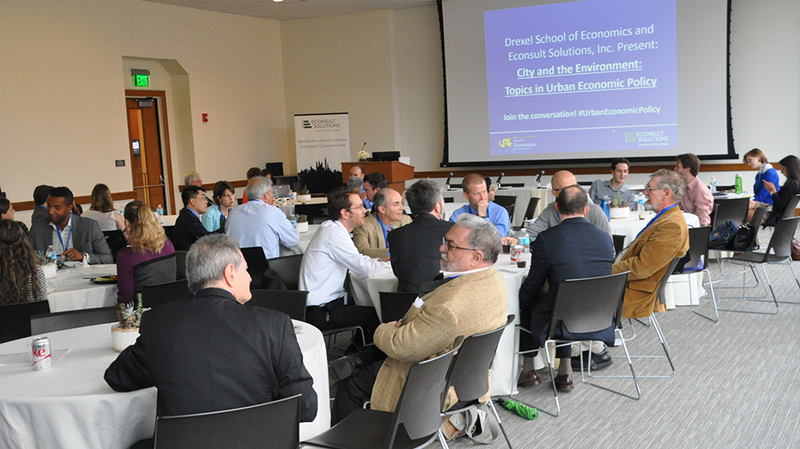 Friday, September 27, 2 p.m.
Drexel LeBow’s School of Economics and Econsult Solutions, Inc. hosted their first annual joint conference, entitled City and the Environment: Topics in Urban Economic Policy.